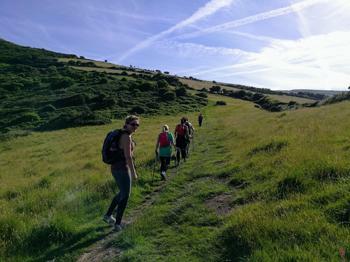 We are returning the the Wild Pear Centre in Combe Martin for our second Fitness Walking Weekender event. This beautiful stretch of the North Devon coastline will be both our home and our playground for two days. This weekend will involved a day of walking on the Saturday (coastal, so highs and lows) and half a day on the Sunday. Please make sure that you are physically able to walk for that amount of time. On both Saturday and Sunday we'll have lunch out (all included in the price) and on Friday and Saturday night we'll be looked after by local cafe owners Kathy and Aileen at the Wild Pear Centre. This payment of £100 (inc VAT) is for the deposit. A further £200 (inc VAT) is due by Friday 1 March in full and final payment.. We have a small number of shared room options and there is a £30 (inc VAT) supplement per person if you wish to have one. First come, first served. Please comment in the notes field if you wish to take this option. Please read the terms and conditions for cancellation. For cancellations made after 2 May 2019: no refund.